Baan Rajprasong is located in a leafy alley just 100 m from Ratchadamri BTS station. Overlooking the Royal Bangkok Sports Club, the neighbourhood is known for luxury shopping and dining, all within easy walk of the hotel. 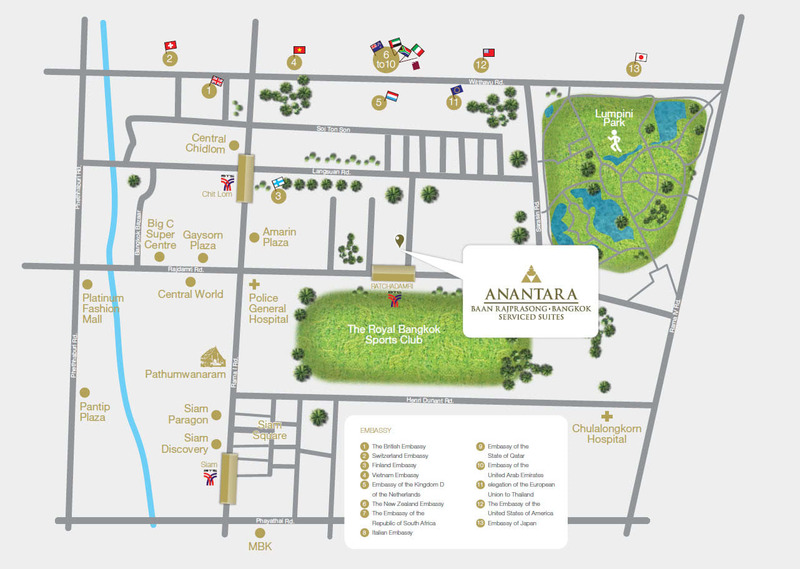 Anantara Baan Rajprasong Bangkok Serviced Suites is approximately a 45-minute drive from Suvarnabhumi International Airport or just a 25-minute drive from Don Mueang International Airport. Head west and at the roundabout take the first exit. Follow the signs for Bang Pa-In / Rama IX and continue to Sirat Expressway, exiting towards Din Daeng. Follow the signs for Sukhumvit / Bang Na / Dao Khanong and take exit 1-02 towards South Ploenchit. Merge onto Duangpitak Road and then onto Sukhumvit Road. Head to Rajdamri Road then turn left onto Soi Mahardlekluang 3. Head southwest towards Don Mueang Tollway and continue to Chalerm Maha Nakhon Expressway. Follow the signs for Sukhumvit / Bang Na / Dao Khanong and take exit 1-02 towards South Ploenchit. Merge onto Duangpitak Road and then onto Sukhumvit Road. Head towards Rajdamri Road then turn left onto Soi Mahardlekluang 3.